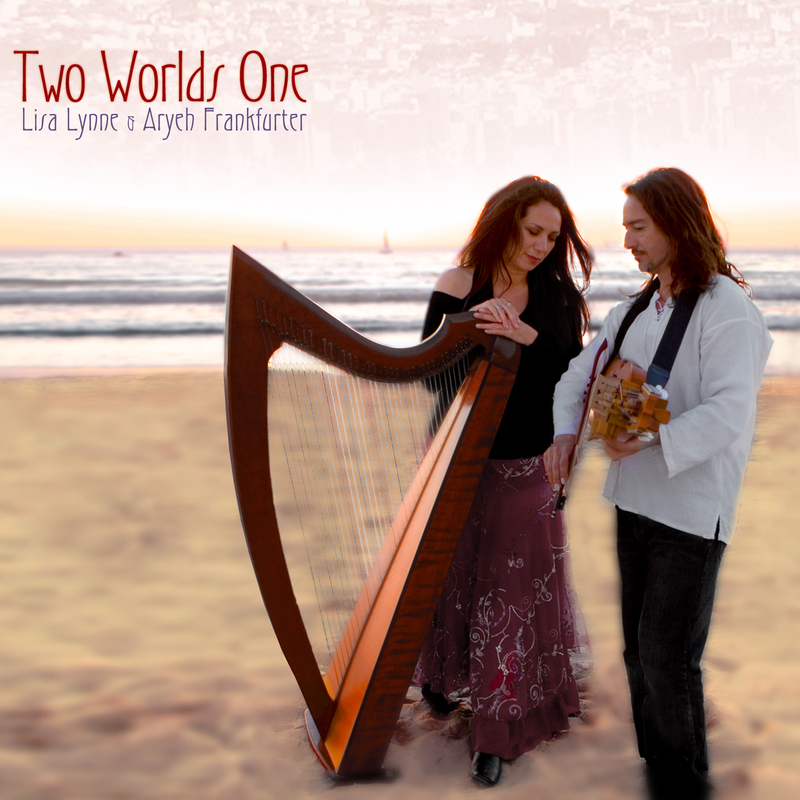 Lisa Lynne and Aryeh Frankfurter perform traditional melodies and original compositions rooted in world folk traditions. This CD features the Celtic folk harp and Swedish nyckelharpa, supported by a rich assortment of acoustic instruments to create a graceful and heartfelt collection of timeless music. Mostly mellow tunes with a couple of livelier pieces mixed in. There are five originals by Lisa Lynne, six traditional pieces, and one original by Aryeh. Both of us have produced many records and from that we knew and respected each other. In fact, as a teenager playing electric violin in a rock band and just starting Celtic harp, Aryeh had read a newspaper story about a heavy metal bassist who also played the harp. That was me. Both of us spent our early years street-performing with our harps and became recording artists. Our paths however, never crossed until many years later when we teamed up to drive together to present at a harp conference in Montana; a mini tour to include some shows along the way and in which we would share the bill and accompany each other on stage. It was on that long drive we realized that we both loved all the same unexpected music. Certainly we both enjoyed and revered Medieval, Renaissance, Celtic folk and world music. But it was actually the 70’s AM pop and progressive rock – the music we both grew up on – over which we bonded. So we performed each other’s music; each adding distinct musical sensibilities and various instruments to the other. Aryeh had recently taken up the Swedish Nyckelharpa to play on Lisa’s tunes and Lisa was playing more mandolin and guitar with Aryeh, on his. There was magic from the very first notes we played together. Everyone who experienced our concerts wanted to have a recording of the music as we were performing it. So after the tour, with our favorite songs of each other’s in mind, we commenced a recording project in Aryeh’s San Francisco cottage recording studio. This basement studio looks to be a museum-worthy collection of exquisite wood and strings. Add Lisa’s special instruments and you have a wealth of possibility – a veritable troubadour’s dream. We embarked to make the best recording we could: one which would be infused with the energy and spirit of our collaborative vision, our two worlds of musical history, a fusion of ancient and contemporary coming together into one…Two Worlds One. This recording is the result. It’s a very honest and sincere offering and we hope we did justice to this music we love. We wish it to bring a bit of beauty and grace into your home and your life, like it has to ours.